With the Grandkidz with us, every morning was an early one, so we were on the road in Walcott fairly early. First thing I saw as I stepped out of the hotel was this big semi carrying a blade for a wind turbine. This would set the stage for some subsequent visits along the road this day. You never really know how big these are until you have a frame of reference, like a huge truck. From the truckstop we meandered into the small town of Walcott to get a glimpse of something really unusual. A house built to look like a medieval castle… Castle Hall. According to stories, this was built in 1905 to look like Balmoral Castle in Scotland, but it is nothing like it in my eyes. This goes to show that you never know what you might see in small town America!! From Walcott it was Westward Ho towards Iowa City, with a quick stop in Coralville. I got to visit with Thomas Jefferson there while waiting for Marissa and the kiddos at the Coral Ridge Mall. While I was waiting I also caught a couple of bugs on flowers…. From Coralville, we headed south on US 218 towards the small town of Riverside, IA. Why Riverside? Well, the small quaint town is “officially” the Future Birthplace of James T. Kirk, Captain of the Starship Enterprise — Star Trek. Apparently, Gene Roddenberry approved the Riverside Town Council’s recommendation to make it so….in 1985. The future historical birth, which is set to take place on March 22, 2228, is also celebrated annually by the people of Riverside. There is also a small History Center and Souvenir shop in town as well as a bench dedicated to someone and it was donated by none other than William Shatner, the original Captain Kirk from the old Star Trek TV series in the 1960s. The town holds an annual TrekFest in June that draws thousands of Trekkies. This was not my first venture into Trekkiedom…. 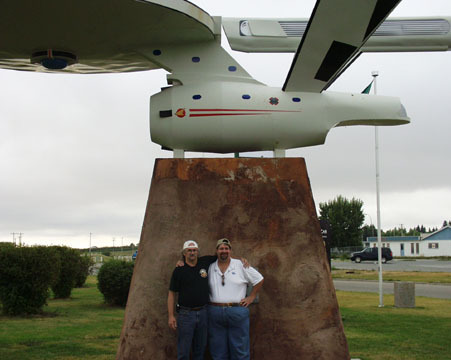 back in 2007 I visited the town of Vulcan in Alberta, Canada (see my blog post) with my good friend “Crafty Jack” Burger (see my longer post about that visit), a guitar maker from Lethbridge. I got a good shot with the scale model of the Enterprise there. Well, enough about boldly going where no man has gone before. We ventured further south for a quick stop in the small town of Swedesburg, IA….a little taste of Sweden. The straw goat, also known as a “Julbock”, is one of the biggest symbols of the Swedish Christmas tradition and also serves in this town as a lure to come visit the town and its famous museum. Since the Swedish museum was closed, it was further south towards our planned for destination. But, we had to go through Mt. Pleasant and so I stopped to get a shot of their local Statue of Liberty. From Mt. Pleasant we proceeded west on US 34 until we hit Iowa Hwy 16, which we took south to the town of Eldon. Why Eldon? Well, this actually is a very famous place in the history of American Art as it is the location of artist Grant Wood’s 1930″American Gothic” painting — you know, the one with the two folks, the guy with the pitchfork in front of the house. Not only is the painting famous, but it is probably one of the most parodied pieces of art anywhere (in my opinion). Only a few other images, such as the Mona Lisa or Scream, by Edward Munch, are as widely known as American Gothic, and because of its high visibility, the painting is an easy choice as a parody. The visit starts at the American Gothic House Center, just a few yards from the actual house in the painting. This is not only a museum dedicated to the painting, but it also houses a number of parodies, provides visitors with prop clothing to wear and do their own photo in front of the house, etc. The original portion of the house that contains the two Gothic windows was built in 1881-82 by Catherine and Charles Dibble. As the original owners of the home, it is listed on the National Register of Historic Places as the Dibble House. Grant Wood used his sister Nan and his dentist Dr. B.H. McKeeby as the models (see more here). Ironically, the models for the artwork never posed together when they were drawn prior to, or during the painting of American Gothic. This was conceptualized by the Grant Wood. So, what about the parodies? There are a number on display in the museum, some of which I am showing below. There is actually a page dedicated to a number of them here. There is also a blog dedicated to the parodies – American Gothic Parodies. Shawnee, Kansas photographer Jason Tracy (see his site) has kindly given me permission to use his high res photo of a Klingon man and woman at the Gothic House. Jason has a number of unique and offbeat Conceptual Portrait works (see them here). Of course, we can also do our own!! And that is the real fun of this place. Here we got my granddaughter and grandson to pose (not too willingly mind you…) And then I got a couple of them in myself. Besides the Gothic House, Eldon does have a couple of murals, an old (and famous) opera house and a few other goodies…. As we left this fun little town, lo and behold, I ran into another rooster with a top hat. Two in two days!! After such a fun time in Eldon, it was hard to move on, but we did. We returned north on Iowa Hwy 16 to US 34 and then continued west until Ottumwa and then north on US 63 towards Des Moines. At the junction with Iowa163 we veered west in order to take the children to Pella to see the giant Vermeer Dutch Windmill and even get them a treat at one of the fabulous Dutch bakeries there. This was my second time there and I am always impressed with the architecture, especially that of the Pella Opera House and the Pella “Klokkenspel”. The Historic Pella Opera House was opened in 1900 and has gone through a number of renovations and uses. Today it is a colorful reminder of both Dutch heritage and early 1900s architecture. The Pella “Klokkenspel” has eight four-foot mechanical figures that perform at regular intervals to the music of a 147-bell computer driven carillon. This is one of only a handful of animated musical clocks in the United States. Unfortunately, we were not there during a performance time of these characters, which are held daily at 11:00 am, 3:00 pm, 5:00 pm, and 9:00 pm. The building also adds a unique flair to the beauty of downtown Pella. The bakeries in Pella are absolute delights. On my last trip to Pella (see post here) my wife and I visited the Jaarsma Bakery, but on this visit Marissa and kids dropped into the Vander Ploeg Bakery, which is only about 5 doors down from the Jaarsma. Both of them offer “Dutch letters,” those crispy, flaky, buttery pastries filled with almond paste, shaped into an “s,” and covered with large, crunchy sugar crystals. The kids loved them!! From Pella we continued on Iowa 163 all the way into Des Moines and then on to Interstate 235. Along the way we passed the impressive Iowa Capital building with its gold plated dome and four other domes. One of the most impressive capital buildings I have seen in my travels. Continuing westward toward Adair we could begin seeing the huge MidAmerican owned Rolling Hills wind farm, which currently consists of nearly 200 Siemens 2.3 MW turbines, making it the largest wind farm in Iowa. According to a number of reports, the state generates nearly a quarter of its energy from wind, first in the nation, and the number will soon grow as more than 600 more wind turbines are slated for installation through 2015. Wind Turbines are massive monsters. Unlike the old Dutch windmills (as seen in Pella), these units are about 262 feet tall from base to rotor shaft (twice as high as Niagara Falls!!). The blades are each 161 feet in length and the rotor diameter is 331 feet. The wind farms are a boost to the economy of the counties involved as farmers and other land owners get thousands of dollars for the utilities to use their lands. Some consider them unsightly. I love the graceful feel of these “modern flowers” blossoming out of the fields. With these added funds, it is no wonder that Adair, Iowa has a famous Smiley Water Tower!! The town of Adair is humorously known as “the happiest town on Earth” and its town welcome sign greets visitors with “Welcome to Adair It’ll make you Smile!”. At the gas station in Adair there was a flag made from plastic cups inserted into a nearby fence. 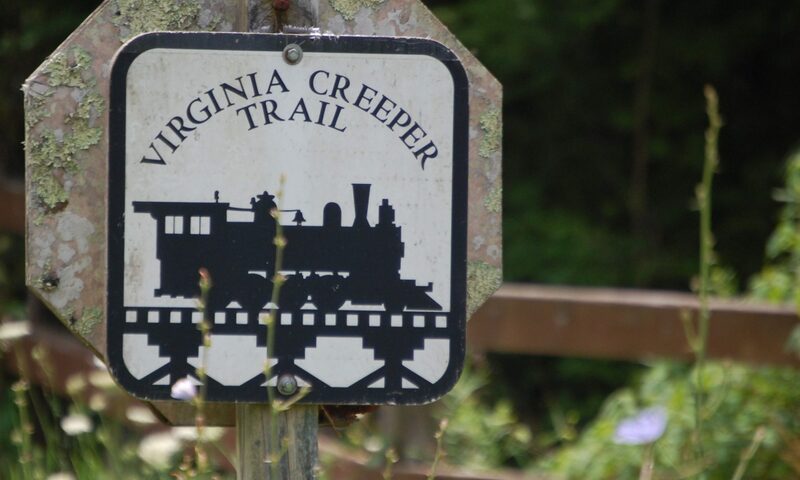 Adair also has a not so friendly history as it was the site of the first train robbery in the West and was also the world’s fist robbery of a moving train. The notorious Jesse James and his gang robbed a train supposedly carrying $75,000 in gold on the evening of July 21, 1873. Unfortunately for them, the shipment was delayed and they only were able to get away with about $3000 worth of gold. There is an historical park in the town that we didn’t have time to visit. There is more about it here. Interstate 80 runs through the beautiful rolling hills of northwestern Iowa. The drive down Interstate 80 from Adair to Council Bluffs is really beautiful in mid-September as the corn has turned brown, wildflowers are in bloom everywhere and the soybean leaves are turning yellow. Here are a few scenes from the road…mind you, it was late afternoon so the shadows made things even more thrilling! Soon after hitting Council Bluffs we arrived in Nebraska and headed toward rain. We made our way to Nebraska City, the birthplace of Arbor Day. Overall it was a great day of travel and the grandkidz had a fun time. Rest up for Nebraska City promises lots of fun on Day 3! After being gone for nearly a month in Idaho and then a few days in Dallas for work in mid June (2013), I took the final leg of this adventure and a two day trip to return home to Lexington via Branson, Missouri, where my wife was visiting with her sister. This would turn out to be another fun adventure as I traveled through Oklahoma and the Ozarks. Following is the route I took for the trip. I left in the afternoon and arrived about midnight in Branson. I headed straight up US 75 to Denison and while there at least got a glimpse of the HUGE Eisenhower statue that can be seen off of the freeway. I took a photo of it while driving by, so it is not as good as I would have hoped. I continued north on US 75 until it turned into US 69 as I crossed into Oklahoma and made my way into Durant, Oklahoma. Durant is one of those unique small towns that brings me so much enjoyment in travel. Durant is in the Choctaw Nation and is currently ranked as one of the fastest growing cities in the United States. It is in a very nice area near lakes and rolling hills. There are colorful horses dotting the town and some other surprises as well!! Turns out that Durant, Oklahoma is also home to the “World’s Largest Peanut”, a title it shares with two other monuments in Texas and Ashburn, Georgia. This monument is for the peanut growers in Bryan County and I found it on the front lawn of Durant’s city hall. Finally, on the way out of town I ran into these unique scrap metal horses in a park in Durant. These appear to be the handiwork of South Dakota “found metal sculptor” Doug Owen. From Durant I headed north on US 69/75 through a number of small towns until I got to Atoka, Oklahoma. Atoka, Oklahoma is a town of a little over 3000 people. It was settled in the mid-1800s and was an important stop on the Butterfield Overland Stage Road. The small town was considered the capital of the Choctaw Nation in the late 1800s and was named after Captain Atoka who led his people here during the “Trail of Tears” in the 1830s. Due to my time constraints, I didn’t have a lot of time to stop along the road on this trip, but I did make my way past the beautiful Atoka Reservoir and into McAlester, Oklahoma. Upon arrival in McAlester I got to see a throwback to the 1950s…at the Happy Days Hotel there are 50s themed rooms including the “Elvis Suite,” “I Love Lucy,” James Dean and Marilyn Monroe rooms at the hotel. One of the more spectacular sights along the drive north on US 69 is the huge Eufaula Lake, with over 600 miles of shoreline, it is the largest lake in Oklahoma. It was beautiful as I approached close to sunset. The next morning my wife and I took two cars and drive back from Branson to Lexington, Kentucky. We had to get back, so we didn’t have much time to see anything in Branson. I did get a photo of a huge guitar sticking out of a building…. The drive across southern Missouri is always nicer OFF of the freeways. I had been on US 60 between Branson and Sikeston three or four times. But, of course, there are always interesting things to see along the way. Gotta love a name like Uncle Rooster’s!! They even have a giant rooster out front…. From Seymour, the countryside becomes mainly farmland until about Mountain View and Cabool. We saw thousands of rolled bales of hay and other nice rural scenery along the way. We stopped in Mountain View, Missouri for a quick rest break and a drink. While there, lo and behold, I saw some scrap metal horse sculptures that looked amazingly similar to the ones I had seen in Durant, Oklahoma the day before. I believe they are the work of South Dakota artist Doug Owen. Not soon after seeing the aerial acrobatics of the plane above, we made our way into Sikeston, Missouri. Sikeston is at a major junction of US 60 from the west, Interstate 55 (N-S thru Sikeston) and Interstate 57 from the east. But for me, the real highlight was being able to once again visit Lambert’s Cafe. I had been to the one in Ozark, Missouri a number of years ago, but never to this one. Lambert’s is one of those places that buses full of tourists stop at, highway drivers stop and more. All sorts of Kitsch with license plates everywhere, old photos and, most importantly – good food and LOTS of it. But, perhaps the real drawing card is the “Throwed Rolls”, a tradition at these stops since the beginning. To get a roll you must raise your hand and they throw it to you. You miss and hits the floor….too bad! The unique thing about this place is the Family Style servings. You order your food and a side and then they bring you a number of other sides – fried potatoes, fried okra, macaroni and tomatoes, black-eyed peas and more. These are as much as you care to eat. The environment there is fun as well…. Need a big cup? Plenty of souvenirs at Lambert’s!! After a hefty lunch, we really wanted a nap, but we actually had to scoot onwards towards home. Just a short zip up I-57 and we were in Cairo, Illinois where the Ohio and Mississippi Rivers meet for one of the biggest confluences in the country. There are two big bridges to cross at this point. One moment you are in Missouri, a few minutes later you go through Illinois and straight into Kentucky. After driving the narrow KY Hwy 286 to Paducah, we were excited to get on the freeway, but, I got a taste of Dallas in rural Kentucky as we were stuck in non-moving freeway traffic for well over 30 minutes. Stuck in traffic on I-24 east of Paducah – shades of Dallas…. But, after it all cleared up, we were on I-69 breezing away and then eventually onto the Bluegrass Parkway. And, finally, back home in Kentucky after being away and on the road for over 5500 miles, 33 days and driving through 15 different states during that time.